Kaymito – Scientific name: Chrysophyllum cainito L.
Spreading crown, grows to a height of 15 meters with numerous slender branches. Young tips are copper-collored and covered with hairs. 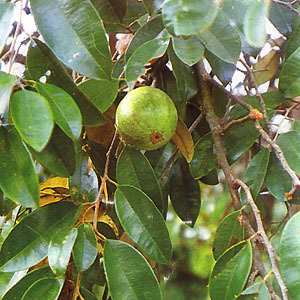 Leaves are leathery, pointed at the tip, blunt or rounded at the base and covered with silky, golden-brown soft hairs. Dysentery: Decoction of the bark. Tonic: Infusion of the bark is tonic and refreshing. This entry was posted in List of Medicinal Plants in the Philippines and tagged kaimito on March 16, 2009 by Pinoy Herbs.